Habitat: Growing in nature in exclusively red, recent lava in sun exposed spots at up to about 600 m altitude where they form large upright open shrubs. 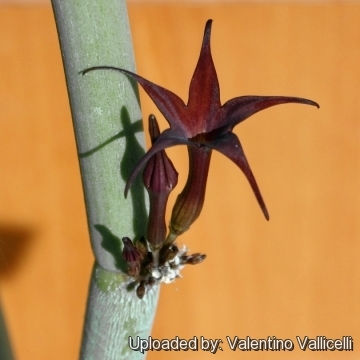 Description: Ceropegia fusca is unusual in that it grows more like a shrub with several spreading, cylindrical branches, branching mainly near the base which may attain a height of 60-90 (or more) cm. 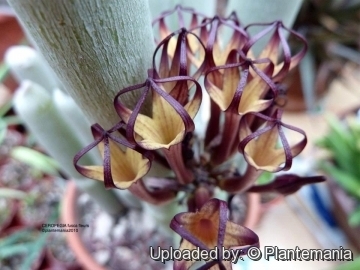 The stems grow upright in tight formation looking something like organ pipes with short-lived linear leaves on the tiops. 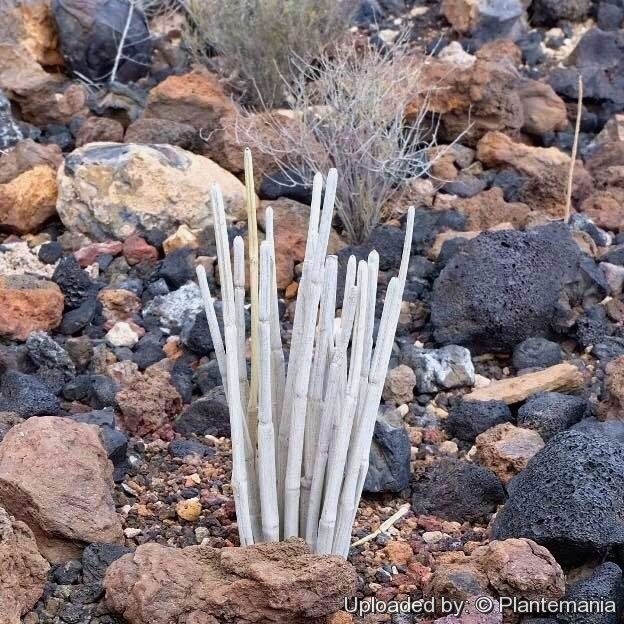 The name was given because of the fuscous or greyish-brown stems, however, in the natural state the old stems often become very white and are said to resemble a cluster of bleached bones. In habitat the younger joints are readily dropped when conditions become too hot and dry for the plant to sustain them. Ceropegia fusca has been known since 1832. 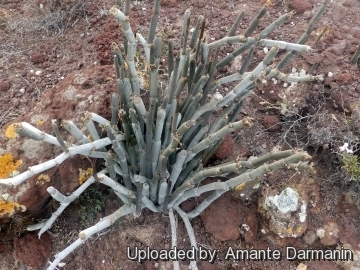 Stems: Many, strongly succulent, thornless, almost leafless, joined, simple or repeatedly forked, erect (or sometime lying down when they reach more than one meter in length) woody 80 to 150 cm (or more) tall, they are glabrous, glaucous-grey, reddish-green to olive green densely covered with white wax under very sunny conditions. They taper from a diameter of just over 12 mm at the base, diminishing at the nodes, to just under a 6 mm in the last node. 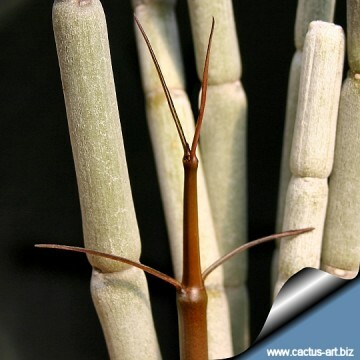 Leaves: Sessile, at each node and on the tip of the stem appears few narrow, straight, needle-like leaves 2-5 cm long, 1,5-4(-9) mm wide, arranged in opposite pairs, they are deciduous and wilt quickly if there isn't enough water. 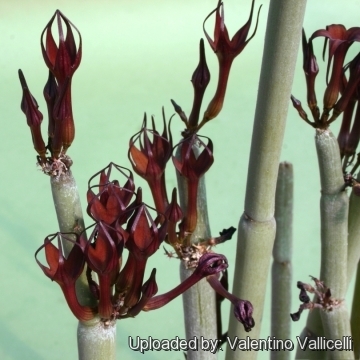 The plant is leafless for most of the year. Flowers: The lantern shaped flowers are produced in sessile clusters of two to five in the leaf axils. Sepals narrow triangular 2-3 mm long. Corolla about 3 cm long, tubular, glabrous outside, dull reddish brown, with five narrow lobes joined at the tip. Tube thinly hairy inside and white or very pale yellow, about 2.5 cm long, swollen at the base, cylindric above and slightly bent; lobes about 12 mm long, deltoid-lanceolate, tapering. into slender tails. Corona light yellow. Pedicels very short (2-4 mm). 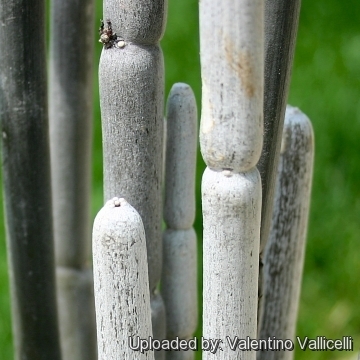 Fruits (pair of large capsules): Up to 10 cm long containing numerous brown seeds provided with a plume of white hairs (coma) that favours their dispersion by the wind. Notes: Ceropegia fusca together with Ceropegia dichotoma is one of the two 'stick -ceropegias' of similar habit, which are found on the Canary Islands, but C. fusca possesses a low number of stomata. This species is usually found at lower altitudes than C. dichotoma and is able to grow in drier habitats than that species. The stomata are more deeply sunken than in C. dichotoma and are hidden behind shedding cuticle flakes on the entire stems, even on young shoots, and not only on older parts, as in C. dichotoma. 9) Wikipedia contributors. "Ceropegia fusca." Wikipedia, The Free Encyclopedia. Wikipedia, The Free Encyclopedia, 9 Dec. 2015. Web. 9 Dec. 2015. 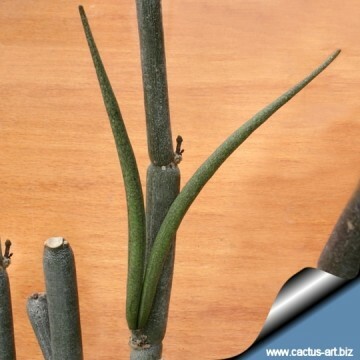 Cultivation and Propagation: Ceropegia fusca is used as an ornamental plant in dry and drought tolerant water conserving gardens. It need full blasting sun and makes a very handsome pot plant but it is not suitable for indoor culture. Can be grown outdoor in mild climate where it proves to grow well semi-neglected. It is also very resistant and is very rare to see an aphid or a sick part, be only aware of mealy bugs. Waterings: Furnish moderate water in warm season, drier in winter. Exposure: It requires hot conditions and how much sun as possible to grow well. Propagation: It is propagated by seeds and pieces of stems. Before planting the segments, it is advisable to wait a week to let the cut to dry and heal. They then root easily. 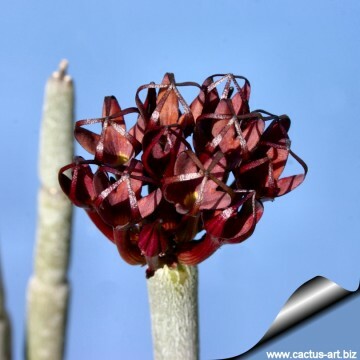 Uses: It is a slow grower plant not suitable for indoor culture, it can be used as an ornamental plant in arid gardens. It requires hot and very sunny conditions to grow well.